Popular charging brand RAVPower has officially launched HyperAir - their exclusive charging technology. Setting a new standard for all wireless chargers, HyperAir offers the fastest wireless charging speeds available for iOS and Android users with speeds of up to 7.5W and 10W respectively. “The launch of the latest iPhones brought a lot of attention to wireless chargers as Apple finally embraced the technology. However as manufacturers scrambled for a market position, the market was flooded with cheap wireless chargers that perform poorly letting down mobile users”, said RAVPower co-founder, Allen Fung. “Our HyperAir technology corrects this by offering the fastest charging speeds available as well as unparalleled usability”. While RAVPower is no stranger to the world of wireless charging, HyperAir extends the possibilities of all wireless chargers. In addition to 7.5W for Apple devices and 10W for Android, HyperAir also features temperature control, instantaneous device detection, and a higher heat dissipation structure. Know more. 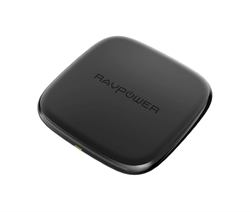 HyperAir technology can be found in the RAVPower RP-PC066 Fast Wireless Charger. Currently on sale on Amazon for $35.99. Founded in 2011, RAVPower has grown to become the one-stop power charging solution for millions of customers from around the world. RAVPower's wide variety of portable chargers ranges from high-capacity external battery packs to travel-friendly multiport USB chargers to high-tech offerings that utilize Qualcomm's Quick Charge technology. Founded in 2007, Sunvalleytek has grown to become a leading eCommerce company that is home to seven major international consumer brands: RAVPower, TaoTronics, VAVA, Anjou, and Sable. From energy-saving LED desk lamps to next-generation portable chargers to 100% pure essential oil, the Sunvalleytek's brands have regularly become top-sellers in many leading eCommerce platforms across the world.